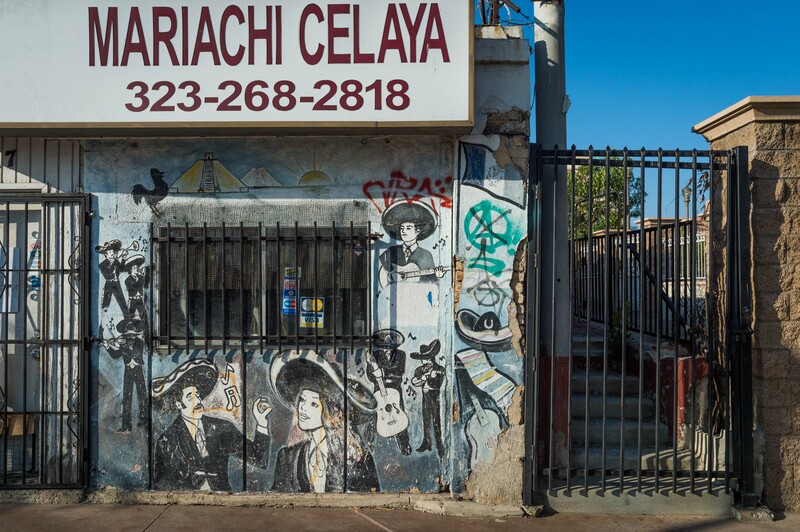 ART OF TRANSIT: There’s a reason they call it Mariachi Plaza. Photo by Steve Hymon/Metro. The folks at Urban One — a firm that provides management of urban developments — have assembled two mighty interesting charts. The first shows the number of people and the number of jobs within a half-mile of each Metro Rail and BRT station. The second chart shows the stations ranked by population. What do we learn from the charts? A few things. •The Green Line’s Mariposa Station — located in an industrial park south of LAX — has the fewest people living within a half-mile while the Red/Purple Line’s Westlake/MacArthur Park Station has the most followed by the Purple Line’s Normandie Station. As CurbedLA notes, “it is interesting that the stations with the highest populations aren’t the ones immediately in Downtown” L.A.
•The Red Line and Purple Line subway has the most people and jobs within a half-mile. Not a shocker, given the subway runs through downtown L.A. and includes stations in Koreatown and Hollywood. •Some stations that have low populations and number of jobs near them (when compared to other stations) remain busy, however. The one that jumped out to me was the Gold Line’s South Pasadena Station, which also has relatively little parking. Please check out the charts. What’s your take on them? My three cents: I think the charts show there is room to steer more residential and job development near transit stations in the appropriate places. I live near the Gold Line’s Allen Station and I can tell you that almost nothing has changed on Allen Street since the Gold Line opened and Allen is zoned for commercial uses immediately south and north of the tracks. The automobile industry looks to be among corporate America’s biggest beneficiaries. Sales of trucks and sport utility vehicles jumped 9.1 percent last month from October 2013, according to Autodata Corporation, as consumers flocked to more expensive, less fuel-efficient models that generate bigger profits for automakers. Passenger car sales registered a 2.8 percent increase. But while some experts fear that efforts to conserve energy will falter if gasoline prices stay low, automakers say they will be more careful this time about ramping up production of S.U.V.s in response to cheaper gas, to avoid being left with bloated inventories when prices eventually rebound. The other obvious question is how lower fuel prices impact the use of transit for users who have a choice between driving and taking the bus and/or train. It’s also worth noting that regulations remain in place in the U.S. to greatly increase fuel efficiency for cars and trucks by 2025, which hopefully will prevent some overconsumption. The donation from the oil company was just $2,500; the more interesting part of the article is that crowdfunding is being used to fund bike lanes in Denver and elsewhere. Concerning Urban One article. High population resulting in higher rail use. This supports the idea that a Light Rail Line from West Los Angeles to Downtown L. A. via Santa Monica Bl. and Sunset Bl. is a priority. While both streets are primarily commercial most cross streets are high density residential. What better place to build the next Light Rail Line than along this corridor. It could well become the most heavenly used line in the system surpassing both the Red/Purple Line and the Blue Line. If it were light rail, it’s potential capacity would be far lower than Red/Purple. Although I agree this should be a high priority. Interesting chart, although expect the downtown density to shoot way up as all the construction downtown finishes. I’d hardly describe Mariposa as being “in an industrial park.” It’s conveniently located to several hotels, a soccer field, and the Toyota (formerly Healthsouth) Sports Center, as well as quite a bit of industry, and it’s about a mile-and-a-half walk from the Flight Path museum in the old Imperial Terminal (a walk I’ve taken twice, round-trip, once to see the Endeavour land, and once to actually visit the museum). Scooter + cheaper gas = cheaper than taking Metro. Yesterday I filled up the gas on my scooter. Came out to be a whopping $3.04 to fill up the 1 gallon of tank in the scooter. And $3.04 of gas lasts me a week. Why should I pay and choose between a $100 for a monthly Metro pass or pay $1.75 each way when $3.04 lasts an entire week on my scooter? You’re so funny – all you do is comment on every article touting your scooter lifestyle. If you’re so done with Metro, why do you even visit this blog, let alone comment like a child? Some of us are actually interested in the future of transit infrastructure – if you’re so in love with your scooter, stop trolling this site. I have to disagree with the comment above written by Transit Rider. It’s actually better to have more comments like this so that people can know what their alternative options are. Especially in LA where people think about it’s a black-and-white choice between a car or taking transit and no other option exists. People never really consider motorcycles or scooters as an alternative option, and it’s great that we have more diversity in voices. If there is a mode of transportation that fits between the car and public transit, why not? After all, this is a government run thread dealing with transportation issues in LA County, which includes not just public transit projects, but also freeway projects, streets, TAP, etc. Anyone has the right to write their opinion here. Otherwise, telling people to “go elsewhere” goes against the fundamentals of democracy. If the OP is a LA County taxpayer, he has all the right to post here on a taxpayer funded board. Aside from merely being a troll on a transit blog, you are also not presenting the full costs of owning a scooter. 1. The vast majority of scooters require premium gas, where are you getting premium gas for $3.04? 2. Scooters require occasional oil changes, maintenance, insurance (if over 49cc or if you are smart), etc. “$3.04 a week” not exactly accurate. 4. You are failing to also calculate the risk (cost) of you getting ran over and severely injured/killed while riding your scooter. And yes, pedestrians do get hit in Los Angeles quite often, but the damage one is likely to incur/chance of having an accident increase dramatically when you are on a scooter. The OP could have some gas left in the tank and filled it up to a gallon (no one drives until bare empty). Isn’t insurance for two wheelers dirt cheap like $100 a year? I hear that all the time from Geico ads. Scooters get MPGs in the range of 80-100 MPG. That means one can travel over 80 to 100 miles on 1 gallon of gas. At 1 gallon of gas now coming below $3.00, that’s less than $3.00 to cover 80-100 miles. That’s pretty “long distance” if you ask me. 80-100 miles per week is about what I travel and that’s pretty long distance. I end up paying less than $3.00 for 80-100 miles per week. How far do you think you cover in distance using Metro? Do you cover 80-100 miles a week on Metro? Most people who ride Metro don’t travel that far. How many people actually do Sylmar to San Pedro trips as opposed to K-Town to DTLA? Unless there’s a study that proves otherwise, the vast majority of people who take Metro do not do long trips. As for oil changes and maintenance, it’s so easy to do and cheap that you can find Youtube videos on how to do it. Insurance is cheap, I have mine from AAA and it costs me little over $120 a year, full coverage. Break that over 12 months it’s $12 a month. Cheaper than a monthly bus pass. As for the dangers, this is really not much different from the dangers of riding a bicycle. Besides, most parts of LA are traffic jams where cars on the road are like parking lots. Having a scooter has its pluses in being agile enough to squeeze right through in between cars while all the cars and buses are stuck in traffic. Buses still have to deal with traffic just as the rest of the cars out there on LA surface streets. Put it that way, scooters can be zippier, faster, and cheaper than taking the bus. Besides Noam, have you considered that in most third world countries, scooters are the main mode of transportation? Ever consider why? Because it’s cheap, fast, and fuel efficient, and more reliable than public transit. LA is practically a third world country anyway. I think you’re just jealous that for all the years you’ve spent wasting your money on public transit, you’ve never at once considered the alternative called the scooter which could’ve saved you tons of money that you could’ve bought a nice scooter by now. I mean really, spending $75-$100 a month in bus passes times how many years? For about $1000 you can buy a cheap Chinese scooter. Less than a year’s worth of monthly passes could’ve bought you a scooter that gave you the freedom to go where ever you want, when you want, for pennies per mile in gas, in less than $12 in month on insurance, and maintenance so easy all you have to do is watch Youtube videos. And yes, this is a public board. Just because one isn’t a Metro rider, doesn’t mean that person can’t participate in discussions here. Metro also builds freeways, ExpressLanes, and surface streets, and bike lanes. They also deal with fare hikes and increases. What I’m saying is perfectly valid: if Metro does a fare hike, I provide the people with options that you don’t have to deal with Metro’s fare hikes and there is another alternative than just choosing between Metro or the car. It’s called a scooter. No one ever thinks about that. And people don’t think about it because you don’t have actual scooter riders telling and teaching people how cheap it can be over taking Metro and cars. Because, in the end, that’s what matters to everyone: price. How much it costs to get from point A to point B. Regarding your inquiry about the impact of fuel prices on transit ridership, you can look at Metro’s own data for Metro bus and rail routes to see that transit ridership has decreased by approximately 5 percent in the last year (from 1.57 million average weekday boardings in 2013 to 1.49 million average weekday boardings in 2014). At the same time, fuel prices in the region have decreased from more than $4.50 per gallon to less than $3.50 per gallon, a decrease of approximately 25 percent. Discounting any other variables, this data implies that transit ridership is sensitive to fuel prices with an elasticity of approximately 0.2 (i.e. a 1 percent change in fuel costs causes a 0.2 percent change in transit ridership). This data trend precedes the recent fare policy change. Can you think of any other explanation for the recent ridership decrease? Keep in mind that the ridership estimates on metro.net are compiled using six month averages — in other words, the numbers are compiled over the previous six months. I’ll talk with some of the folks at Metro and try to get their thoughts. Ridership has been flat in recent times. I suspect the economy played a role in that, and perhaps still does. It’s perhaps worth noting that there has been some notable maintenance issues impacting service on the Red/Purple and Blue Lines this year. I am not one of those that thinks Uber/Lyft etc are a major threat to transit ridership, but since you brought up maintenance, Steve, I can say I haven’t even considered taking the red line to go out at night in months. One train every 20 minutes after 8 pm is insane. And it’s been that way almost all year. I’m just one rider but an Uber easily beats that for a few dollars more. Duly noted about the subway maintenance and I’ll pass along your comments to both operations and customer service. Re; population and employment chart for each Metro station. They did a separate ranking by population. It would have been nice to see another one by employment. Too bad it was the Blue Line and the Green Line that were opened first back in 1990 and 1995 given the lack of jobs in the vicinity, while the Red/Purple Line wasn’t finished it’s current form until 2000 and the Gold Line and Expo Line weren’t opened until years later. I do recall there were supposed to have been jobs in the vicinity of the Green Line when they were planning it, but they vanished with the end of the cold war and nothing replaced them. Ideally, the line with the heaviest potential ridership is opened first not last. If the first Shinkansen line in Japan had been the Nagano Shinkansen with 9.5 million annual riders or the Kyushu Shinkansen with 12 million annual riders, High Speed Rail would have been declared a failure in Japan. Instead the Tōkaidō Shinkansen was opened first and immediately declared a resounding success. It currently carries 143 million annual riders, the most for any single High speed rail line in the world. Wilshire Subway should have been built first and not still years off in the future, with the other lines built later as offshoots or extensions instead of the other way around. But, no crying over what didn’t happen. However, the supposed failure of Metrorail in the 1990’s did give ammunition to opponents of mass rapid transit in Los Angeles, who shall remain unnamed. A side note. It would appear that the California High Speed is going to make the same mistake Metrorail made in its initial segments. EXACTLY. Metro has had to pander to politicians representing lower density suburbs, demanding rail lines that extend into sparsely populated areas like Foothill phase 2, instead of high density corridors guaranteed to have the highest ridership – the Wilshire subway is a great example, also the Sepulveda Pass and rail along Santa Monica Blvd – these lines would attract over 100,000 daily riders easily, even without zoning/land use changes. And yet we have to wait until 2035 for the 2nd biggest job center in LA (Westwood/century city) to get rail service while places like Irwindale (population less than 1,000) gets rail by 2016. The Board should focus on high performing projects FIRST. We don’t have the money to waste it on low performers like Foothill phase 2. Metro is pursuing federal funding in order to build phase 2 of the Purple Line Extension by 2025 — phase 2 ends at Century City. The third phase wouldn’t be complete until the mid 2030s unless funds are found to accelerate. Well obviously no one is gonna pay $1.75 each way just to go to their neighborhood supermarket when gas prices are decreasing now are they? The bus fare is more expensive than the cents in gas it costs to do a short, quick trip under 5 miles. Actually the Red Line was started first I believe but since it is a subway it took longer to even get MOS 1 running between Union Station and Mac Auther Park. The portion of the Subway now known as the Purple Line was stopped due to legislation sponsored by Congressman Henry Waxman. The reason he gave was fear of a methane explosion but in fact it was “old money” in the Hancock Park area along Wilshire Bl.